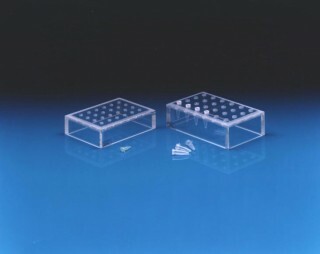 These racks are suitable for carrying and storing up to 24 microcentrifuge tubes. The ⅜" thick, clear acrylic helps reduce exposure to beta radiation. The open bottom permitsrapid equilibration of the tubes when placed in a constant temperature water bath. The racks can be stacked to save space. This rack holds 0.5 mL tubes.